A retired District Judge has filed a PIL in the Supreme Court praying for setting aside of the action of the Centre in returning the recommendation for Justice Joseph’s elevation while submitting that the government cannot pick and choose names of judges from the recommendations of the collegium. The PIL filed by G D Inamdar, a retired district judge from Solapur, Maharashtra, also prays for direction to the Centre to issue warrants of appointment with respect to Justice Joseph with consequential seniority. Inamdar said he was forced to move court by the “shocking manner in which the Central Government has unilaterally and capriciously segregated and rejected the name of Hon’ble Justice K.M. Joseph - recommended by the Collegium for appointment as a Judge of this Hon’ble Court while at the same time accepting the recommendation for elevation of Ms. Indu Malhotra, Senior Advocate, as a Judge of this Hon’ble Court”. He said he has filed the PIL to “uphold the institutional integrity and independence of the Indian Judiciary, especially the Supreme Court of India, which the Union Executive/Central Govt is brazenly attempting to trample upon”. Inamdar also submits that it is not permissible to segregate the name of one of the two recommendations while approving the other. “If the Government had any reservations on either of the two names recommended, then the entire file must be sent for the reconsideration of the collegium. It is not permissible to segregate. It is not permissible to pick and choose”. “When the Collegium has sent a file containing recommendations of two judges in a particular order of seniority and if the Central government has any objection, over one of the two names as in the instant case, then it should have sent the entire file back to Collegium and sought due permission from the Collegium to process one name and reconsider the other name. Only after the due approval of the Collegium was obtained, the Warrant of Appointment ought to have been issued for that one name”. He says, “The present example is a direct infringement on the primacy and independence of the Judiciary. Under the garb of “reconsideration” the Central Govt effectively seeks to veto the decision of the Collegium and de facto prevent the names of those whom it considers “inconvenient” or worse still, whom it seeks to “punish” for daring to pass independent judgments, which may which may not be palatable to the Centre”. He submitted that “the so called reasons for non-approval of Justice KM Joseph’s name by the Centre for elevation to this Hon’ble Court are mere excuses, as those alleged reasons were not an impediment for the Central Govt, in examples of other Judges, who were similarly elevated to this Hon’ble Court”. According to the petitioner in the context of what the Collegium said in its resolution on January 10 with regard to the outstanding merit of Justice Joseph,it is clear that the Collegium is aware of his position in the all-India seniority list, and yet recommended him, in view of his “outstanding merit”. "The Collegium said: “Justice Joseph is more deserving and suitable in all respects than other chief justices and senior judges of the high courts for being appointed as SC judge”. While recommending the name of Justice Joseph, the collegium took into consideration combined seniority on all-India basis of chief justices and senior judges of High Courts, apart from merit and integrity". He also submitted that it is not permissible for the Central Govt. to sit as an Appellate Authority over the wisdom of the recommendations made by the Collegium. 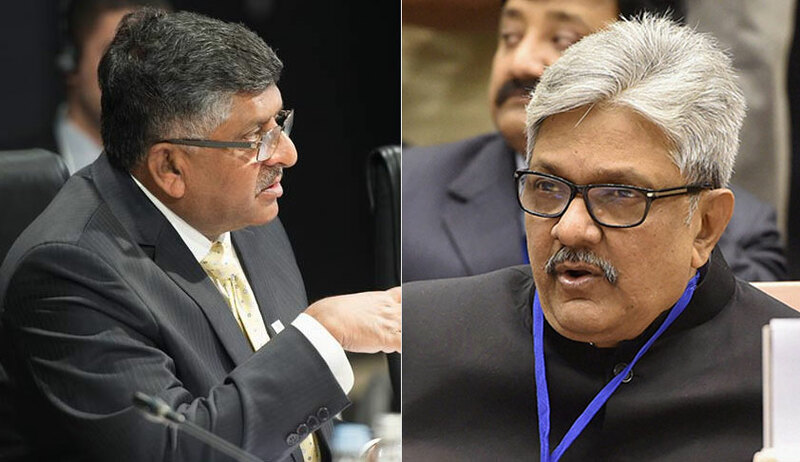 "Since the recommendation discusses the seniority issue and endorses Justice KM Joseph in that regards, it is not open for the Central Govt to take a contrary view and return the recommendation. It is respectfully submitted that the basis for returning the recommendation can conceivably be if there is any new material, that was not considered or not available with the Collegium at the time of making the recommendations but on the same material the Central Govt cannot give its contrary view and return the file. The above has been affirmed and laid down by this Hon’ble Court in the Third Judges case (1998) 7 SCC 739 @ Paras 23 & 24"
He added that the present example is a direct infringement on the primacy and independence of the Judiciary. "Under the garb of “reconsideration” the Central Govt effectively seeks to veto the decision of the Collegium and de facto prevent the names of those whom it considers “inconvenient” or worse still, whom it seeks to “punish” for daring to pass independent judgments, which may not be palatable to the Central Govt". The size of a High Court is never a criterion for appointment to Supreme Court, he says. The petitioner traces entire sequence of events in the current raging controversy surrounding the elevation of Justice Joseph. It is to be noted that “in the meeting of 11 th January, 2018, the Supreme Court Collegium comprising of the four senior most judges – Justice Chelameswar, Ranjan Gogoi, Madan B Lokur and Kurian Joseph and spear headed by the Chief Justice of India Dipak Misra found it suitable to recommend the names of Uttarakhand High Court Chief Justice KM Joseph, who was appointed as permanent judge of Kerala High Court in 2004, and Supreme Court Senior Advocate Indu Malhotra for elevation as Judges of the Apex Court. On 31.01.2018 it was widely reported that the Union Law Ministry has sent back the Collegiums considered recommendation of elevation Justice K.M. Joseph to the Chief Justice of India without forwarding it to the President Ram Nath Kovind for issuing warrants of appointment.